When we last checked in on Republican candidates’ endorsements — an important measure of party and institutional support that historically has some predictive power for nomination races — we found former Gov. Mitt Romney of Massachusetts in a good but not great position. Using a scoring system called Endorsement Points that weights endorsements based on their importance — for instance, endorsements from governors score more points than endorsements from U.S. representatives — Mr. Romney had accumulated about 44 percent of the endorsement capital through Sept. 23. But Rick Perry was not far behind him, at 30 percent, and had been gaining ground. 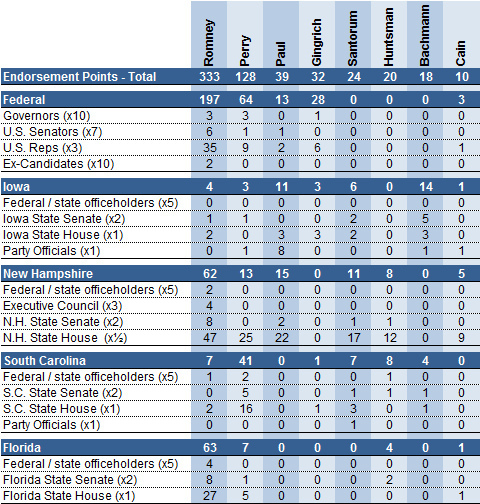 With Mr. Perry having struggled though a series of debates, however, he has received almost no endorsements since that date. 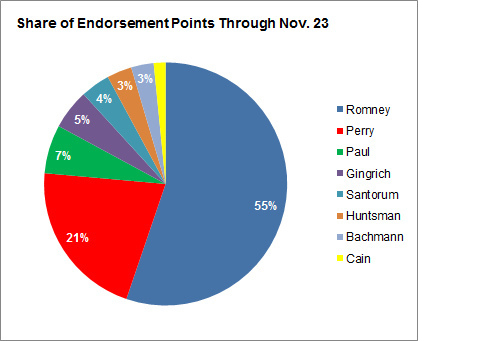 He has accumulated just 13 Endorsement Points during the past two months, as compared with 167 for Mr. Romney. Nor have any of the other Republican candidates, including Newt Gingrich and Herman Cain, made any real progress. 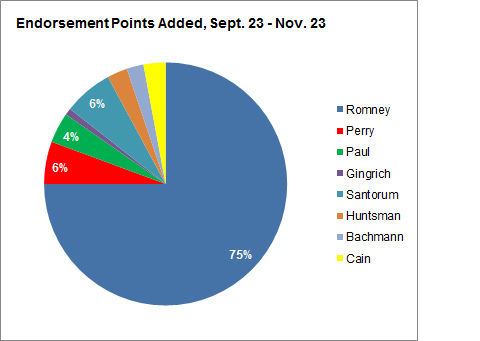 Mr. Romney has dominated the period, picking up 75 percent of the Endorsement Points over the past two months. Mr. Romney recently added the backing of Sens. Kelly Ayotte of New Hampshire and John Thune of South Dakota to his tally. He has also earned a bounty of endorsements from state officeholders and party officials in New Hampshire and Florida, although he has few in Iowa and South Carolina. 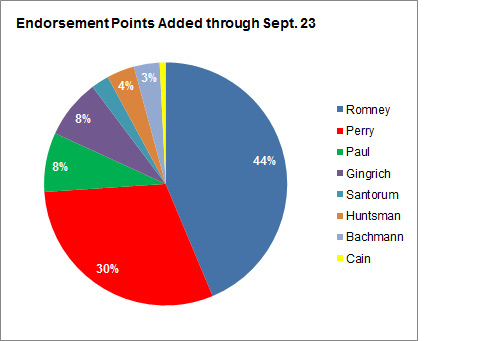 Overall, Mr. Romney has 55 percent of the Endorsement Points from Republicans who have endorsed a candidate so far. Although the pace of endorsements has remained somewhat on the sluggish side — meaning that there are plenty of governors, senators and key state officeholders who remain unaligned to a campaign — a candidate like Mr. Gingrich would have a lot of work to do if he wanted to catch up. The reason these endorsements matter is not that voters care about them all that much about them in a literal sense; a swing voter in Jacksonville, Fla., is unlikely to have her choice swayed by a Romney endorsement from Representative Thaddeus McCotter of Michigan. Rather, they are a signal of party or institutional support as compared to popular support (which is best reflected in the polls). Usually, these indicators are in strong alignment with one another by this point in the campaign. In nomination campaigns from 1980 through 2008, the correlation between the share of endorsements headed into the Iowa caucuses and a candidate’s vote share in the national polls has been about 90 percent. They are not very well aligned this year, however. Although Mr. Romney has 55 percent of the endorsements, he has just 24 percent in national polls, excluding undecided voters, according to the latest Real Clear Politics average. 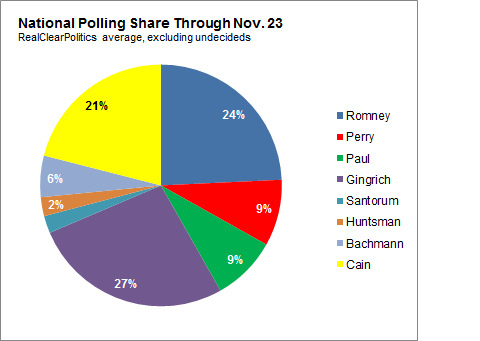 Conversely, Mr. Gingrich has just 5 percent of the Endorsement Points but is at 27 percent in the polls, excluding undecideds. Gaps of this magnitude are not common historically. Unless the measures are brought into better alignment in the next several weeks, 2012 will represent a key test between competing political science theories about how nominations are decided. Do party officials lead the process, eventually coaxing the voters to their preferred candidates? Or has popular support become the key driver and grown more immune to the establishment? As Mr. Romney’s party support has grown while his popular support remains stagnant, this is the question that the nomination turns upon. When your need to know is right now.